REF: OF EVIL TRIPLETS, NATIONAL DEBT AND WHAT NEEDS TO BE DONE! Comrade President, Zambia belongs to all those who live in it, you and me, and we carry, at all material times, individual and collective responsibility and obligation to make it a better place. Comrade President, the events that have been unfolding in our country, have left me very little option, but to address you directly, via this open letter. Comrade President, nobody, and I believe the leadership of this country above all others; can ignore the conclusion that today our country stands at a particular crossroad. I refer here not only to high levels of the evil triplets of poverty, unemployment and inequality, especially among the youths and women, but to the rising and suffocating national debt. I would like to believe that these must be trying times for you as president of our beloved country, as they are for many of us as ordinary citizens. I apologise most sincerely if this letter impose an additional burden on you. Secondly, Comrade President, the Zambian Economy continues to bear strong negative features of all colonial economies, designed primarily as source and reserve of raw materials. These negative features are; it’s based on the extraction and export of raw minerals while importing of finished goods, It is highly unequal, with huge concentrations of wealth among a tiny portion of the population and lastly, It is dominated and consists largely of foreign companies.. It is counter-revolutionary and scandalous to continue maintaining these colonial patterns of our economy. Thirdly, Comrade President, quite often, we tend to forget that 54 years ago, when our people, the heroes and heroines, through collective efforts and wisdoms, liberated this country from colonial oppression and established a new government in 1964, they had, as their primary mandate, changing the material condition of our people through socio-economic transformation of the society we inherited which reflected both political oppression as well as total socio-economic exploitation and marginalisation of the Zambian people. Fourthly, Comrade President, over the last few years, our economic growth has been too slow and small, averaging around 3%. This level of growth is clearly insufficient, and its benefits, if any, only accrue mainly to the richer segments of our population in urban areas. Majority of our people are excluded from its engine room. Continued poverty and inequality confirms this fact. Our national budget, $6,6m in 2017 and $7,6m in 2018 is too small if we are to deal decisively with all of Zambia’s developmental challenges. We need, possibly, five times the budget Zambia has currently in order to have inclusive growth that does not live anyone behind as per the theme of the 7th National Development Plan and Vision 2030. Currently, we are underperforming and barely scratching the surface of our economic potential. Fifthly, Comrade President, A recent World Bank and IMF debt sustainability analysis puts Zambia at high risk of debt distress, indicating that there are heightened vulnerabilities associated with public debt. This indicates that Zambia is accumulating too much debt too quickly and a calmer and more sustainable pace is now required. This reality is very obvious as seen in government revenue and expenditure framework. Our country has been staring at the perfect storm of widening fiscal deficits set against huge expectations and needs. The state’s expenditures far exceed its revenue. Debt dependency undermines a country’s sovereignty and integrity. Comrade President, all these challenges are a painful legacy of colonialism, leadership poverty and corruption; they are the obstacle both to the full enjoyment of freedom and dignity for the majority of our people as well as our nation’s progression to a ”land of work and joy in unity& as envisioned in our national anthem. Comrade President, we did not liberate ourselves to be poor under self-rule. Nor did our liberation have anything to do with personal fortunes of those who might, by virtue of historical accidents, be its leaders at any particular moment. The people of this country opposed colonialism not only because it was unjust and oppressive but also because by fettering the productive forces it denied us the chance to improve the living conditions of all the people. Therefore, Comrade President, for those of us who care the question now is; what is to be done? In this regard, the call for strategic economic transformation is relevant; it is a stepping stone towards inclusive growth. There can be no other way forward for the country. Rapidly growing and strategically transforming the Zambian economy is the challenge of our time. We need to lay a very firm basis for the country`s natural resources to be locally beneficiated and industrialised, 60% at the very minimum. We need to achieve GDP growth in excess of 8% annually on a sustainable basis. We need to establish industrial development zones as part of a conscious and deliberate strategy to uplift the economies of rural communities. We have to walk the talk to get the economy growing faster, bigger, sustainably and inclusively. Unless we take drastic measures now and harness all our domestic resources, we will not escape the cycle of weak growth, mounting government debt, mass poverty, inequality and rising unemployment, for a long time to come. This is what defined and underscored the success of the East-Asian Tigers – including Hong Kong, Singapore, South Korea and Taiwan – that has propelled them to become highly-developed and industrialised economies. 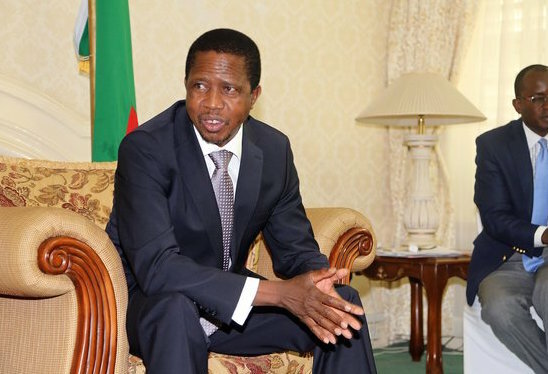 Comrade President, strategic economic transformation must be Zambia’s second revolution, by expanding the productive forces, to make the country prosperous and powerful and improve the living standards of the people as a whole. The country is looking to you, Comrade President, as a representative of the collective will of the people, the first among equals, for leadership. Let us grab the mantle and build the Zambia we want, one that offers a better life for all who live in it. The hashtag, Comrade President, is #Quickly! Yes we want to develop massively, which we have started already. But when anything is put in place to help going forward alot of corruption (cheap) is pronounced by opposition, without bases. China even now has one mind “development”for mother land without negative & baseless accusations. H.E. has a mandate to transform Zambia into figure that will benefit all. But talkative mouths shirk & derail progress. Developing on borrowed money…You cant develop on kaloba ba koswe…you just developing yourselves and your families…You cant fool us any more,we are not blind..A government that does not have any kind of revenue (only through imposing tax on the poor) but good at spending on themselves…what a joke…!